Word ladder puzzles are said to have been invented by Lewis Carroll, and they have been around ever since. The word ladder is a small and popular puzzle, that can be quite tricky to solve. The aim is to move from the word at the top of the ladder to the word at the bottom of the ladder in the given number of steps. 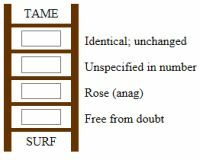 Typically with a word ladder there are two methods of presentation - one is simply a presentation that gives the word at the top of the ladder and the word at the bottom; the second option is that which we use here which has a crossword-style clue alongside each rung which must be answered in the adjacent empty rung of the ladder. Whichever presentation is used the only difference is that there are typically multiple solutions with the open format (without clues), and that these puzzles are usually harder too as there are no clues to help point you in the right direction. With word ladders the key rule is this: you must only change one letter as you move down the ladder from rung to rung, and you must not change the order of any of the letters. Therefore you can move from RUNG to RING by changing the second letter from 'U' to 'I', but you must not reorder the letters - so moving from RUNG to GRIN would not be valid, as although we have only changed one letter here, we have shuffled the order, and that isn't valid. Also each word you make must of course be valid, and appear in a dictionary - and proper nouns are usually banned too, although this is not always the case. We hope that you enjoy solving our word ladders, the small but fun little puzzle!